Explicit BONUS: Food Court "Episode 30: High Flying Bird"
An episode of the podcast FOOD COURT, hosted by Jon Burr and Sean Parrott, featuring guest Chuck Anderson, discussing a movie about the NBA. It's 2/3rds of Fastbreak Breakfast, or 3/4ths if you include the ripped-off food themed gimmick. Please enjoy! FOOD COURT "Episode 30: High Flying Bird"
Hey now, gym rats! 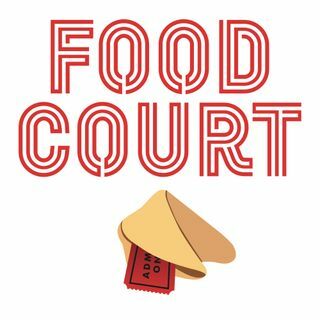 It’s time for a very special CROSSOVER episode of FOOD COURT, your favorite podcast, where we brave the malls and the movie halls so you don’t have to. Sean, Jon, and ... See More Chuck Anderson from Fastbreak Breakfast NBA Podcast (@fastbreakbreak) watched High Flying Bird, Stephen Soderbergh’s latest foray into the sports film genre and, this time, he shot it all on a dang iPhone! Will ol’ Steve remember to turn the phone sideways before he hits record? Will Chuck & Jon be able to recreate their chemistry on a different podcast court (Jon happens to be one of the hosts of Fastbreak Breakfast)? Does Sean know enough about basketball to even keep up? Tune in to find out! So pump up your Reebok’s, wipe the soles of your shoes, grab your popcorn, sneak in your snacks, and pop some antacids because it’s time to hoop it up! Bon Appetit!